MANAGEMENT AND UNION representatives have hammered out a plan to apply the funds made available for the restoration of concessions. 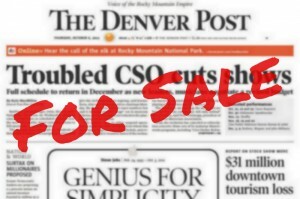 While the profit enjoyed by The Denver Post over the four-quarter period ending June 2011 was not enough to restore all items on the restoration lists, it does give us back most things. The decision on which items to restore was, for the most part, made for us by the rules of restoration and by the numbers. While some employees indicated they would like to have the 401(k) match restored, all of our union contracts provide that the match is available only if all bargaining units select it. Because some units had a very low participation rate in the 401(k) match prior to concessions, it was not the first choice for most members. NEWSROOM: Wages and merit pay will be restored to pre-concession levels including the 1 percent raise not paid on March 15, 2009. Increases are effective as of Jan. 1, 2012 and will show up on paychecks Jan. 20. NON-NEWSROOM: Wages will be restored to pre-concession levels for those in job titles eligible for restoration. Increases are effective as of Jan. 1, 2012 and will show up on paychecks Jan. 20. A few job titles are excluded from wage restoration, including Paperhandlers, Circulation Customer Service Representatives and Associates, Account Executives hired after Nov. 22, 2009, and positions created since Nov. 22, 2009. In February, the share of the dental premium paid by The Post will increase from 50 percent to 64 percent. NEWSROOM: Mileage reimbursement will be restored to IRS rate (55.5 cents per mile) for photographers and bureau reporters, and to 5 cents below IRS rate (50.5 cents per mile) for all others. The increase is effective January 15, 2012. The increase will show up on paychecks Feb. 3. NON-NEWSROOM: Mileage reimbursement will be restored to IRS rate (55.5 cents per mile) for DMs and ADMs, and to 5 cents below IRS rate (50.5 cents per mile) for all others. The increase is effective Jan. 15. The increase will show up on paychecks Feb. 3. NEWSROOM: Night differential will increase from $2.25 to $4.00 per shift effective as of Jan. 15. The increase will show up on paychecks Feb. 3. All newsroom employees working night shifts starting this week need to be aware of this change and input the correct information in their timecards. For example, prior to this week if you worked past 7 p.m. for five days, you entered a total of $11.25 for the week. Starting this week you will enter a total of $20 for five days of night differential. All members should be aware that bargaining for our next contracts has begun. The Teamsters started talks last week. The Guild units, both newsroom and non-newsroom, will begin this week. The Mailers will begin talks in February. To keep up with what’s going on during bargaining, sign up to receive email updates (“Follow Us Via Email” on the sidebar).